Transparency Market Research (TMR) has published a new report titled, “Unna Boot Market - Global Industry Analysis, Size, Share, Growth, Trends, and Forecast, 2018–2026”. According to the report, the global Unna boot market was valued at US$ 90 Mn in 2017 and is projected to reach US$ 144.6 Mn in 2026, expanding at a CAGR of 5% during the forecast period, 2018 to 2026. Factors, such as, rise in prevalence of venous leg ulcers and increase in incidence rate of injuries related to accidents, sports, and adventures are driving the growth of the Unna boot market, globally. Moreover, global aging population and better efficacy and wound healing features provided by Unna boot bandages at competitive prices are propelling the growth of the global market. North America is expected to dominate the global Unna boot market during the forecast period due to rise in adoption of Unna boot in the region for treatment of venous leg ulcers and associated conditions. Asia Pacific and Europe are projected to be potential markets for Unna boot. The Unna boot market in Asia Pacific is expected to expand at a CAGR of 5.9% during the forecast period. Rise in prevalence of venous leg ulcers is major driver of the Unna boot market. Research suggests that incidence of venous ulcers is higher among the aging population. As per the National Institutes of Health, the U.S., venous leg ulcers account for 70%-90% of ulcers of the lower leg and affect approximately 600,000 people in the U.S. annually. The annual cost of treating venous ulcers is estimated at US$ 2 Bn to US$ 3 Bn in the country. The American Academy of Orthopedic Surgeons (AAOS) revealed that around 25% of sports injuries were related to lower extremities, such as, ankle and foot. Thus, increase in injuries related to sports, accidents, and adventures is projected to drive the Unna boot market in the near future. 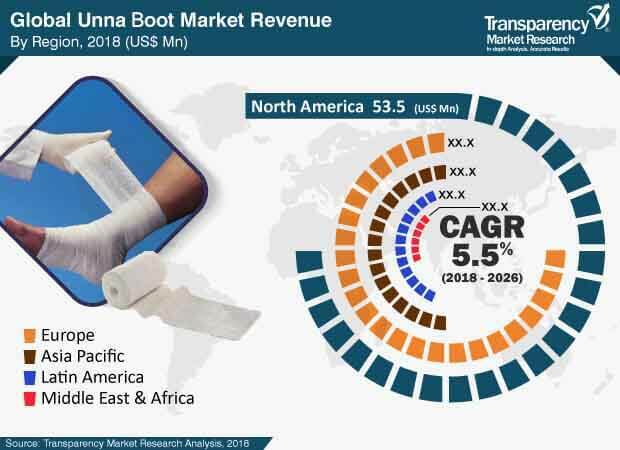 Growth in aging population across the world and better efficacy and wound healing features provided by Unna boot bandages at competitive prices are propelling the global Unna boot market. Average price of Unna flex compression bandage in the U.S. is US$ 4-US$ 12. Also, it is easily available without prescription.